Synonym(s): RNA tumor virus group (and related agents). Comments: In view of current knowledge of retroviruses, the "previous" classification into subfamilies (oncovirinae, lentivirinae, spumavirinae) is no longer appropriate, since the genera that made up, for example, oncovirinae are no more closely related (or similar) to one another than they are to members of other previously designed subfamilies. Retroviruses are currently classified into 7 genera. RNA. Single stranded. Linear; genomic nucleic acid positive sense. Genome dimeric (monomers held together by hydrogen bonds). Genome monopartite. Total genome of one monomer 7000-11000 nucleotides long. 5' terminus has a methylated nucleotide cap. Cap sequence of type 1 m7G5ppp5'GmpNp (type A). 3' terminus of each monomer has a poly (A) tract; 3'-terminus has a tRNA-like structure. Encapsidated nucleic acid solely genomic, or both genomic and non-viral (however, host derived RNAs and small DNA fragments are believed to be incidental inclusions). Virions enveloped; slightly pleomorphic; spherical; 80-100 nm in diameter. Surface projections of envelope small (surface appears rough), or distinct (8 nm long glycoprotein); spikes; dispersed evenly over all the surface. Capsids isometric (to spherical), or rod-shaped (or a truncated cone). Nucleoid of spherical nucleocapsid symmetric, or asymmetric. Virions only of one kind. human T-lymphotropic virus (HTLV) Viral particle seen by Scanning electron microscopy (SEM) at a magnification of 26,400x of human T-lymphotropic virus attacking a T-lymphocyte . This image is from Dennis Kunkel's excellent Microscopy Science and Photography Through a Microscope web site. 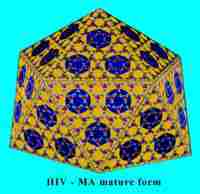 human immunodeficiency virus The Figure shows a paper model based on molecular modelling of HIV MA 'fullerene-like' network published by Forster, Mulloy and Nermut in J.Mol.Biol.,298:841, 2000. Image by Milan Nermut. human immunodeficiency virus AIDS virus attaches to a healthy CD-4 Receptor Site - from Custom Medical Stock Photo (CMSP) which has a edition digital catalogue available on the internet. Contact this commercial venture for more information. human immunodeficiency viruses Pseudocolored transmission electron micrograph of human immunodeficiency virus (HIV) on infected human lymphocyte. Observe the daughter hiv cells leave the infected t-cell for a new host. This image from Custom Medical Stock Photo (CMSP) which has a edition digital catalogue available on the internet. Contact this commercial venture for more information. human immunodeficiency virus - type O A scanning electron micrograph of 2 AIDS virus(HIV-O) particles on a CD-8 cell surface. magnification is 200,000 times, in a hand colored black and white print. This is from Custom Medical Stock Photo (CMSP) which has a edition digital catalogue available on the internet. Contact this commercial venture for more information. human immunodeficiency virus HIV budding from a T-cell. Image from Custom Medical Stock Photo (CMSP) which has a edition digital catalogue available on the internet. Contact this commercial venture for more information. HIV cartoon with core exposed from the Graphics Gallery at Genentech's Access Excellence Biotech Information Site. HIV cartoon from the exHIV website by Dolph Kahn, Russia. Immature HIV particle Characterized by a disorganized central core but otherwise able to infect lymphocytes. This particle is tightly attached to the membrane of this cell. From the Fermin Lab at Tulane. Immature HIV particle cartoon From Dr. Milan V.Nermut of the National Institute for Biological Standards and Control. 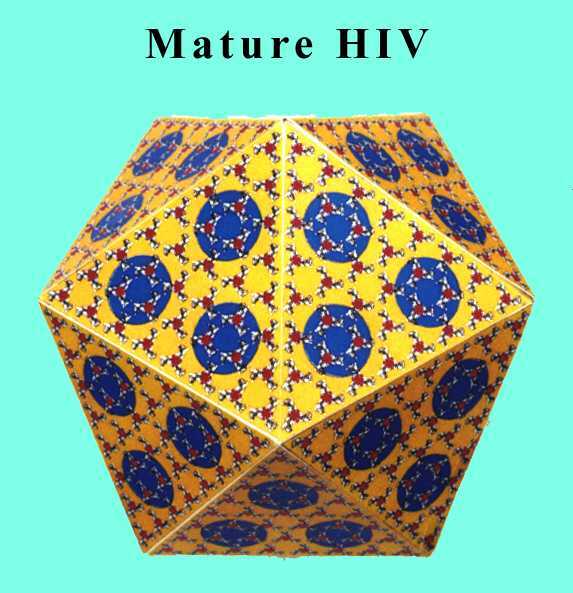 Herts, U.K.
We have a special retroviral structures page for Dr. Mermut's images. Mature HIV particle cartoon From Dr. Milan V.Nermut of the National Institute for Biological Standards and Control. Herts, U.K.
We have a special retroviral structures page for Dr. Nermut's images. Human immunodeficiency virus This is the first EM photo of HIV on the internet. Viral particles are seen at medium magnification in this electron micrograph. Note the central core and the outer envelope. The image was provided by Edward C. Klatt, M.D., Department of Pathology, University of Utah. From AIDS Pathology. Human immunodeficiency virus Viral particles are seen at low magnification adjacent to the cell surface in this electron micrograph from AIDS Pathology. Human immunodeficiency virus Viral particle is seen budding from the infected cell surface at the top, with a complete viral particle at bottom in this high magnification electron micrograph from AIDS Pathology. Human immunodeficiency virus, structural components, diagram. The structural components, including the key antigenic components, of human immunodeficiency virus are diagrammed here. From AIDS Pathology. Human immunodeficiency virus 1, genomic diagram. The genome of the human immunodeficiency virus (type 1) is shown in this schematic diagram. From AIDS Pathology. 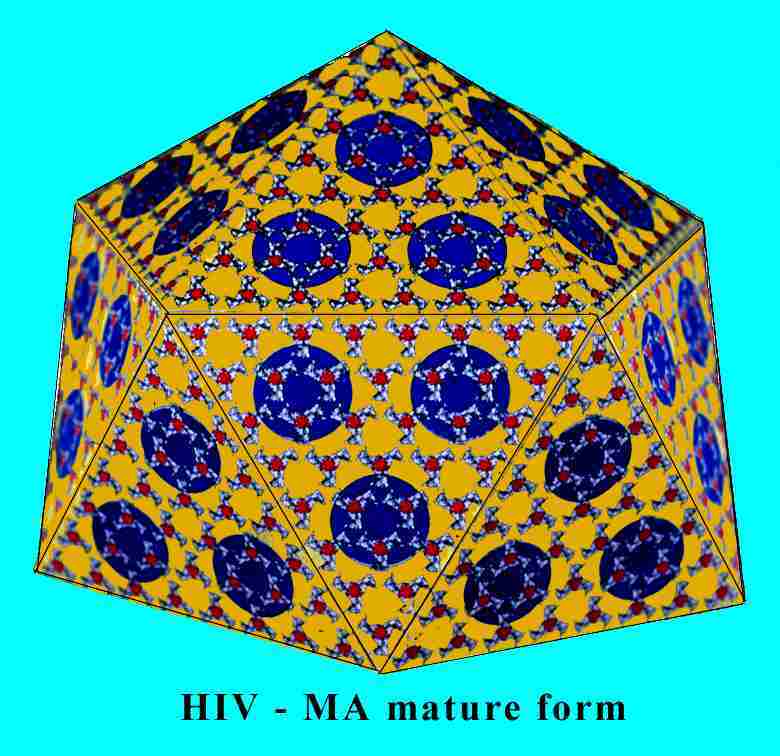 A 3-D diagram of the mature human immunodeficiency virus From the Harvard AIDS InstituteLibrary of Images, courtesy of Critical Path AIDS Project, Philadelphia. giant cells - syncytia - resulting from fusion of HIV infected lymphocytes From the Laboratory for Infectious Diseases, Denmark. immature human immunodeficiency virus From the Laboratory for Infectious Diseases, Denmark. human immunodeficiency virus From the Department of Microbiology, University of Otaga, New Zealand. human immunodeficiency virus cartoon Various HIV proteins are labelled. From the Department of Microbiology, University of Otaga, New Zealand. Human Immunodeficiency Virus, HIV, life-cycle computer graphic This computer generated art quality graphics of HIV was done by Russell Kightley of Canberra, Australia. Human Immunodeficiency Virus, HIV, computer graphic This computer generated art quality graphics of HIV was done by Russell Kightley of Canberra, Australia. human immunodeficiency virus cartoon From the What is HIV website.